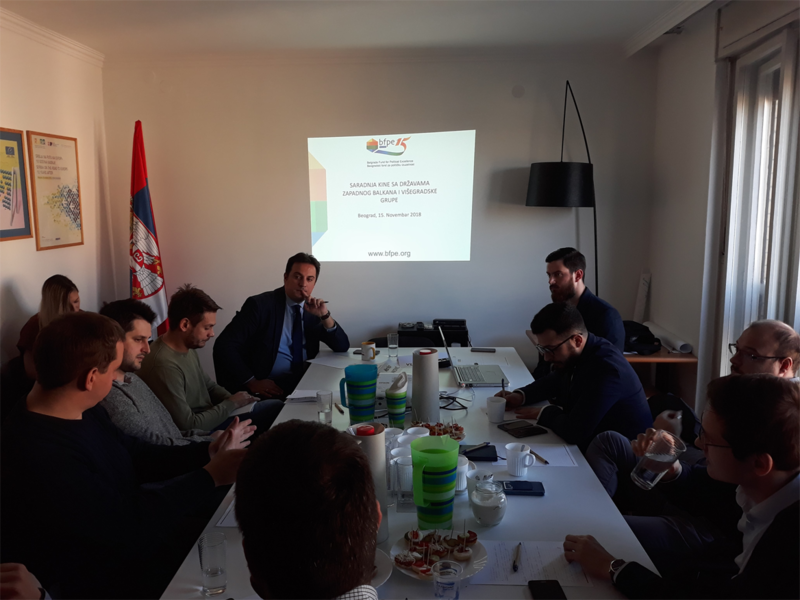 A round table on a topic “Cooperation of China with Visegrad Group and Western Balkan countries” was held on 15th November, in the Belgrade Fund for Political Excellence premises. This round table is a part of the project ““Comparative analysis of the approach to China: V4 + and One Belt One Road” ” which is implemented in cooperation with Prague Security Studies Institute (PSSI), and with the support of International Visegrad Fund. We presented the first findings and data collected during the research within the project. These findings included experiences from 4 Visegrad group countries (Czech Republic, Slovakia, Poland and Hungary) and their cooperation with China. We also presented results of the research that is related to China’s presence in Serbia. The main discussion was about the general political relations of mentioned countries with China. We also indicated trends in foreign trade relations; trends that include large trade deficits, but small percentage share in total foreign trade balance of the state as well. The special accent was on the data about China’s foreign direct investments in the countries that were included in this research. We draw the line between foreign direct investments and loans, and indicated the largest investment projects, main sectors of cooperation and tendencies of increased presence in the past. The participants of the round table are introduced with screening mechanisms that are (not) used for evaluation of the impact of foreign direct investments on the security of the country and the stability of political order, how are these mechanisms established and in which way are they used. After presentation of findings, there was a discussion in which we additionally elaborated presented data, and concluded what are the segments that should be covered more closely. Round table was one of the activities that BFPE implemented within the project. On our website we have two texts on the topic so far: Oversight and control of agreements between China and Serbia, and Relations between Serbia and China, and China’s presence on Western Balkans. On the project “Comparative analysis of the approach towards China: V4+ and One Belt One Road” BFPE cooperates with Prague Security Studies Institute (Czech Republic), Institute of Asian Studies (Slovakia), HAS Center for Economic and Regional Studies, Institute of World Economics (Hungary) and Center for International Relations(Poland), and the project itself is supported by the International Visegrad Fund.